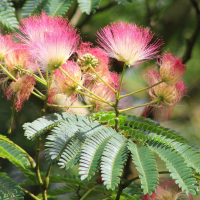 An absolute favourite of mine, 'The Silk Tree' in this form the fascinating silky ball like flowers are a delightful bright pink. 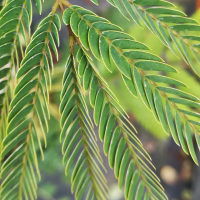 Even without the flowers the mimosa like foliage would win a place with me in full sun. Although Rouge Selection is not a cultivar name accepted by the International Code of Botanical Nomenclature we grow this as we believe it to be a good selected strain of Abizia julibrissin Rosea with extra deep rose pink flowers which make a stunning site during summer. This lovely form of Albizia julibrissin (The Silk Tree) with a rather dubious name, actually perfectly reflects the lovely fine feathery dark chocolate coloured foliage which combined with the fluffy pale pink flowers heads.